The Hubble Space Telescope has zoomed in on the mysterious green cloud of gas known as Hanny's Voorwerp (after the Dutch school teacher Hanny van Arkel who discovered it using the citizen science project Galaxy Zoo) to reveal a zone of star formation. Hanny's Voorwerp as seen by the Hubble Space Telescope. The new image reveals a pocket of star birth as the yellow-orange region at the tip of the eerie green object. Image: NASA, ESA, W. Keel (University of Alabama), and the Galaxy Zoo Team. The mystery object was discovered in 2007 residing close to 650 million light year distant spiral galaxy IC 2497, and is illuminated by the quasar that emanated from the galaxy's central black hole, but which switched off just 200,000 years ago. "What we're seeing is the afterglow from the quasar," says William Keel of the University of Alabama in Tuscaloosa, leader of the Hubble study. "This implies that it might flicker on and off, which is typical of quasars, but we've never seen such a dramatic change happen so rapidly." 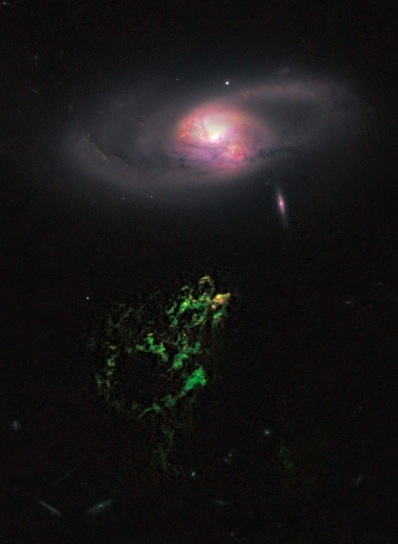 The quasar is responsible for illuminating Hanny's Voorwerp – the green colour is attributed to glowing oxygen – but it may also have cast a shadow on the feature, giving the illusion of a 20,000 light year wide gaping 'hole' in the object. A likely chain of events that gave rise to Hanny's Voorwerp. Image: NASA, ESA, W. Keel (University of Alabama), and the Galaxy Zoo Team. The new image, captured by Hubble's Wide Field Camera 3 and Advanced Camera for Surveys, reveals pockets of star formation in the region of cloud that faces its galactic neighbour. Observations suggest that an outflow of gas from the galaxy's core is interacting with a region of the Voorwerp, triggering its collapse into stars, the youngest of which are just a couple of million years old. "The star clusters are localized, confined to an area that is over a few thousand light-years wide," says Keel. "The region may have been churning out stars for several million years. They are so dim that they have previously been lost in the brilliant light of the surrounding gas." Radio studies also show that the object is not just an isolated pod of gas drifting in space, but part of a much longer structure that wraps around the galaxy, with the section known as Hanny's Voorwerp the only optically visible part. 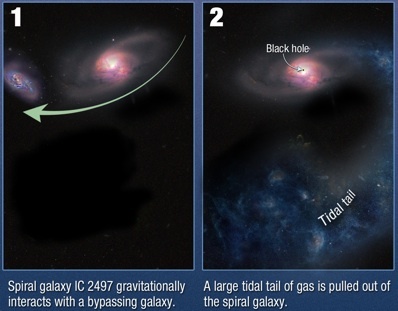 Keel and his team think that the galaxy may have merged with another galaxy around a billion years ago, swallowing gas and stars to feed its central black hole and burping out the long streamer of gas. 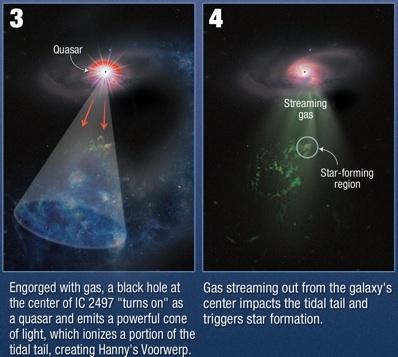 The black hole then powered the quasar which emitted two beams of light, one of which is lighting up Hanny's Voorwerp.